Heightened uncertainty about the ongoing European sovereign debt crisis and the intensifying grip of fiscal consolidation across the eurozone will weigh on the German economy in 2012. These factors will not only curb exports but also dampen the propensity to invest. By contrast, there should be moderate growth stimuli from private consumption. 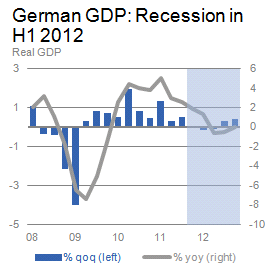 Nevertheless, Germany is likely to slide into a (technical) recession in the first half of the year. Progress in managing the debt crisis could then breathe new life into the economy – net exports in particular – in the second half. All in all, 2012 will probably see flat GDP growth. 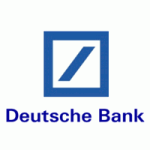 Europe’s sovereign debt crisis is likely to leave a heavy imprint on the German economy in 2012. Certainly, Germany has relatively healthy public finances in comparison with many other industrial countries, and thanks to the moderate development of real estate prices over the past few years households have not been tempted into indulging in excessive borrowing, so this is not a source of consolidation pressure either. However, Germany’s heavy export bias – a major advantage during the global upswing of 2009/10 – will revert to being its Achilles’ heel in the current year. Even after imported intermediates are deducted, German exports still account for more than 25% of GDP. Moreover, 60% of Germany’s goods and services exports are delivered to the other EU member states, with 40% going to fellow members of EMU. So the draconian consolidation programmes that have been launched by many euro countries will noticeably curtail German exports in H1 2012. Demand from the emerging markets will probably not be able to take up much of the slack given the downturn in global trade, so Germany’s export growth is likely to ease to 1 ¾% in 2012 while imports could pick up by 3%. Net exports could thus cost close to ½% of GDP growth after having generated more than ¾ percentage points (pp) of growth in 2011. The European sovereign debt crisis is also expected to damp domestic demand in Germany. For example, capacity utilisation in industry started to decline back in Q4 2011 as demand weakened, reducing the need for new investment. Furthermore, the extreme uncertainties about the further course of the sovereign debt crisis in the eurozone and about the global economy as well as the prospect of more or less subdued equity markets for the time being are likely to dent business sentiment and thus the propensity to invest. True, the fiscal measures and structural reforms already adopted and/or announced by the eurozone members have the potential to resolve the sovereign debt crisis on a longer-term horizon. Besides, the accelerated launch of the European Stability Mechanism (ESM), a funding top-up for the IMF and an abundance of ECB liquidity are aimed at preventing any further escalation in the short term. However, some setbacks have to be expected along the way. Also, political risks in H1 in particular are bound to trigger uncertainties and volatility. For it is during this period that Europe’s national parliaments are to decide the fate of the fiscal compact, the ESM and EU treaty amendments. Our basic expectation is that the necessary political measures will be taken and that initial successes will become visible in the second half. This should help improve the outlook for corporate investment activity as well as net exports in H2. In this scenario we look for investment in machinery and equipment to fall by close to 1 ½% for 2012 as a whole. As the same segment was up by over 8% last year, it was still a key driver of growth in 2011. After rapidly expanding by over 5% in 2011, investment in construction is poised to increase only moderately in 2012 at just under 1 ½%. Residential construction is likely to be the driving force while commercial and public-sector building activity falter. 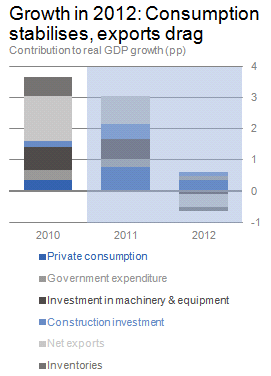 Private consumption looks set to contribute positively to growth in 2012. At close to ½ percentage point of GDP this would be only about half as much as in 2011 (nearly 1 percentage point), though. This is backed by the fact that the unemployment rate is set to increase slightly to about 7 ¼% on an annual average on account of weak overall growth and falling investment activity. While the labour market is much more flexible now than it was at the start of the last decade, the use of working-time accounts is unlikely – given their lower current balances – to do much to help stabilise employment. In addition, probably not as many skilled workers will be retained this time as in 2009 once companies realise that the economic weakness in key export markets is attributable to fiscal consolidation and is thus likely to continue unabated at least through 2013. The German labour market should definitely remain in better shape than its counterparts in most of the other EMU countries, though. Wage developments are likely to have a slightly positive impact on consumption. Household income will benefit from the 0.3 pp reduction of pension insurance contributions, too. Since our forecast predicts a slight decline in employment, though, disposable income is set to increase by just a little more than 2% altogether in 2012, which is a much weaker jump than in 2011 (3 ¼%). However, with the inflation rate decelerating – coming in at 1 ½% instead of 2 ¼% as in 2011 – disposable income will still be up in real terms, nevertheless. All in all, the roughly 2 pp growth contribution from domestic demand seen in 2011 will probably contract to only ½ pp in 2012. Combined with a negative contribution (-½ pp) from net exports this will result in flat GDP growth after 3% expansion in 2011. For the quarterly performance we expect a fairly pronounced recovery in the second half of the year after a technical recession, i.e. two quarters of shrinking GDP, in the first.